Entertainment Weekly has unveiled the newest iteration of the Sonic the Hedgehog comic book debuting in April. 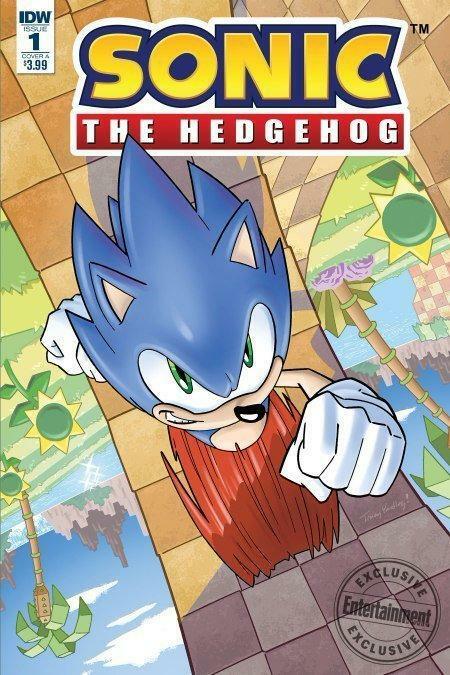 The eponymous super fast blue hedgehog, who has appeared in more than 80 video games since 1991, headlined Archie Comics and Sega's comic book that ran from 1992 until 2016, with nearly 300 issues released. With Sonic's comic book rights since transferred to IDW, the publisher will see the sneaker-sporting hero race back into the pages of comics with the ongoing Sonic the Hedgehog comic book hitting store shelves April 4. IDW will launch the series with four issues, released once per week, before the book goes monthly. Each of those first four issues will feature one of Sonic's allies, starting with longtime sidekick and best friend Miles "Tails" Prower. Writer Ian Flynn will script the series, with fan-favorite artist Tracy Yardley (Sonic the Hedgehog, Sonic X, Sonic Universe) illustrating issue #1. Rotating art teams will take over art duties once the book goes monthly. The series will also introduce new characters to the Sonic canon and will take Sonic and his friends in a "fresh, exciting direction," per IDW. “I’ve been a SEGA kid for life, and Sonic has been my career for over a decade,” said Flynn in a statement. “Ian has a strong connection with both the character and the fans so there was no hesitation in bringing him on to launch this new Sonic series,” said Sonic the Hedgehog editor Joe Hughes. Michael Cisneros, Licensing Specialist at SEGA of America, said Flynn was "undoubtedly" the first choice to scribe the series. Sonic the Hedgehog launches April 4.